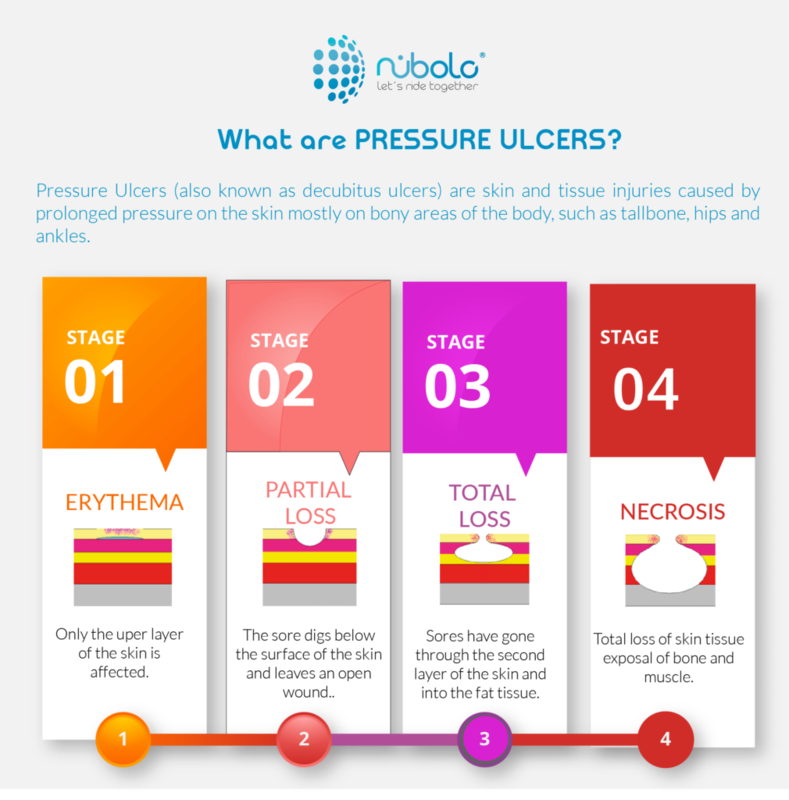 Pressure Ulcers (also known as decubitus ulcers) are skin and tissue injuries caused by prolonged pressure on the skin mostly on bony areas of the body, such as tailbone, hips, and ankles. They can cause serious and painful infections very hard to cure and in extreme cases deadly. Stage I (mildest stage): Only the upper layer of the skin is affected. Symptoms presented may be Itching, burning and pain. The pressure spot may also feel firmer or softer or warmer or cooler from the surrounding area. Treatment: change position, wash and dry, use foam pads, pillows, and/or mattresses. Stage II (superficial erosion or blister): The sore digs below the surface of the skin. Your skin is broken, leaves an open wound, or looks like a pus-filled blister. The area is painful and may be swollen, warm, and/or red oozing pus or clear fluid. Besides steps from Stage I it is recommended to clean the wound with salt-water solution or plain water, always dry it gently. Stage III (crater): Pressure Ulcers look like a crater and have gone through the second layer of the skin and into the fat tissue. They may have a bad smell. Beware of signs of infection: pus, heat, bad smell, red edges and/or drainage. If the tissue around the sore is black it means it has died. Dead tissue needs to be removed and antibiotic prescribed to fight infection. It is recommended to use special beds or mattresses. Stage IV (deep and big): This is the most serious stage and can affect muscles and ligaments. The Skin is black and shows signs of infection (pus, heat, smell, red edges and/or drainage). Tendons, muscles, and bone may be visible. These sores may need surgery and are very long to cure. Immediate attention is needed. Pressure: This happens when there is prolonged pressure on the skin mostly on bony areas of the body, such as tailbone, hips, and ankles (in a wheelchair or bed). The blood cannot flow properly and this causes decrease of oxygen and nutrient to underlying cells. Shearing: This happens when the skin and the tissues move in opposite directions. Friction: This happens when the skin grazes with the support surface. The riskier areas for Pressure Ulcers are those where the body weight is nearer to the skin, for example tailbone, hips, shoulders and ankles. People with a medical condition that limits their ability to move, change positions or spend many hours in a bed or a chair. Different measuring scales exist to evaluate the risk of suffering from Pressure Ulcers, one of them is the Braden Scale. It takes into account 6 different categories: mobility, sensory perception, activity, moisture, nutrition, friction, and injury risk. Depending on the total score professionals can determine the level of risk and decide on the recommended intervention strategies in order to avoid Pressure Ulcers. As always prevention is easier and much cheaper than treatment. In this context, changing position regularly, maintaining the skin clean and dry and using especially designed cushion is a good way to prevent Pressure Ulcers. Pressure Ulcers appear in people debilitated by illnesses, advanced aging or immobilized in beds or wheelchairs. Any person can suffer from Pressure Ulcers but some existing factors can increase their risk. Age over 70 years old. Pressure Ulcers do not affect only the physical and psychological functions, or patients quality of life, they also create very important expenses in hospital fees and medical attention.